Services likely to be launched in 3-4 months, will be available once aircraft reaches altitude of 3,000 meters. Prior this year, the Telecom Regulatory Authority of India (TRAI) greenlit a proposition by the DoT (Department of Telecommunication) to give in-flight voice and data services on all flying machine in the Indian airspace, prescribing that it ought to be allowed with a base height confinement. 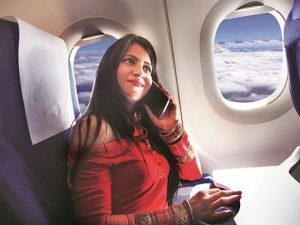 The Telecom Commission of India has today given the last gesture, making ready for in-flight mobile phone calling and Internet or web access to flyers in all local and global aircrafts in the following couple of months. “All proposals by the Telecom Regulatory Authority of India on this have been acknowledged. We are speeding up the procedure (to begin) and inside 3 months it ought to be prepared”, a Telecom Commission official was cited as saying to the media. In line with TRAI’s recommendations, mobile calling and internet access facility in a flight will be allowed once an aircraft has reached a minimum altitude height of 3,000 meters, which normally on average takes around 5 minutes after a plane takes off. The minimum altitude restriction has reportedly been imposed to maintain compatibility with terrestrial mobile networks. “The DoT will now make the essential alterations to the important laws to make a different classification of licenses for in-flight network administrators, which could be telecom specialist co-ops,” a Department of Telecommunications official said. The Minister of Commerce and Industry and Civil Aviation of India, Suresh Prabhu, said he will ensure that the plans are executed as quickly as time permits. Early projections shows that around 25% of aircraft will provide on demand in-flight connectivity to approximately 1 billion passengers in 2018. In order to promote the adoption of in-flight connectivity, the service providers will be charged a nominal fee of ₹1 per year, however, the government will not interfere in the pricing structure laid out by the operators for offering in-flight voice and data services.